Center City Philly on a Sunday evening as Gerry and Joann continue their quest for a suitable location for a Rehearsal Dinner for the December wedding of their son, Keith. Since my wife, Kathy, and I need little excuse to join good friends for wine and food, we were only too eager to attend. Early 5:00 PM reservation makes us one of the first parties to be seated and what appeared to be an all male staff of servers showed immediate and attentive service. Our wines were opened and I was happy to see that Gerry had brought with him, not only his lovely wife, but a bottle of the wonderful, 2007 Merus, Napa Valley Cabernet Sauvignon. It would appear to me that my 2009, Educated Guess, Napa Valley, Cabernet looked just a tad weak next to the big, brawny Merus. Even my second bottle (which never got opened…what a shock, huh Gerry?) 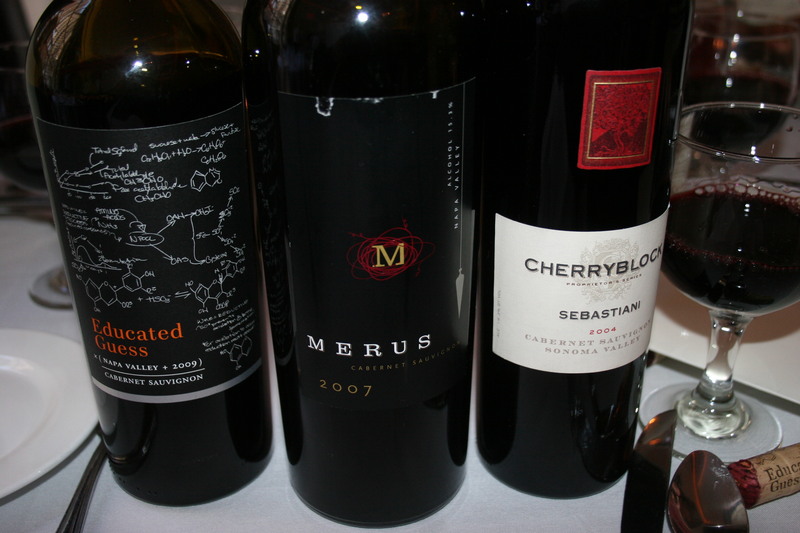 the 2004 Sebastiani, Cherryblock, Sonoma Valley, Cabernet would have had to take a back-seat to the Merus. Lots of black cherry fruit, scents of leather and licorice with a mouth filling texture would make this the wine of many nights. As we looked over the extensive menu at La Viola, our server announced the many interesting and varied specials that were being offered this evening. So many of them sounded so good that we put down our menus and each of us chose both appetizers and entrees from the “specials”. 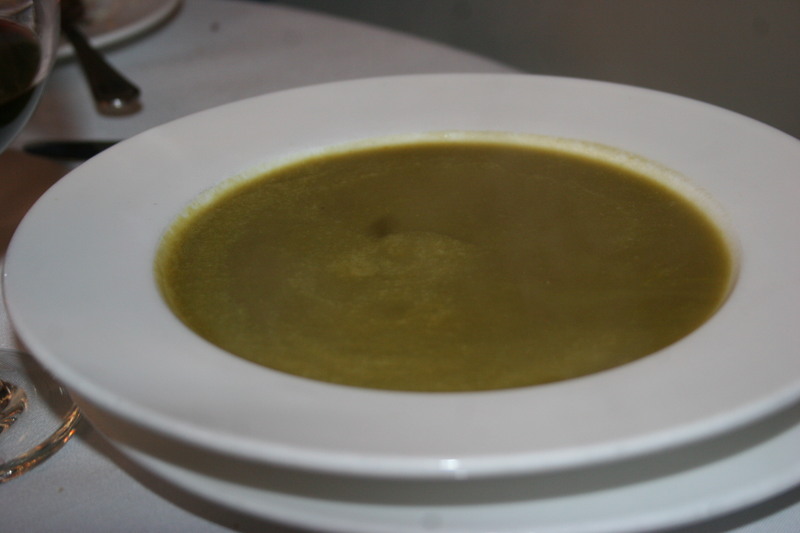 My wife started with the Puree of Leek Soup which was chock full of flavor and served at just the right temperature. I had the Insalada Capricciosa partly because it sounded good and partly because I LOVED saying it! 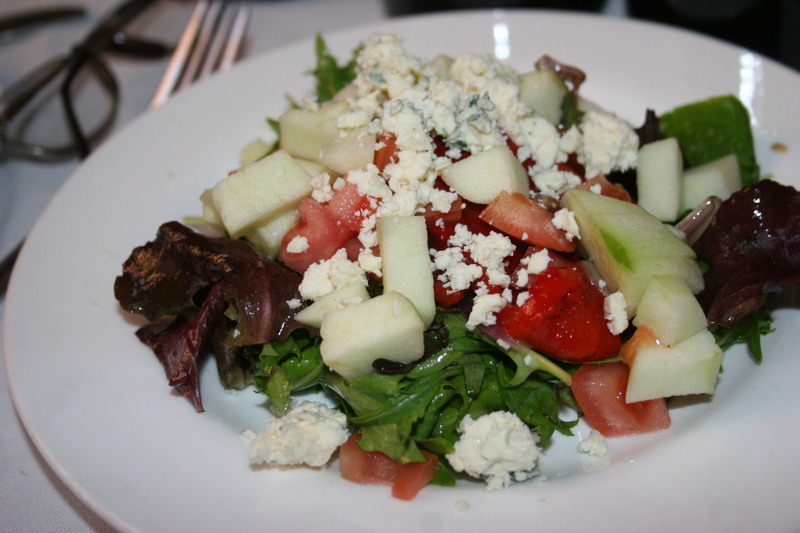 Apples, arugula, gorgonzola cheese, roasted peppers, tomatoes and fresh basil in a tangy dressing. It was an excellent salad. 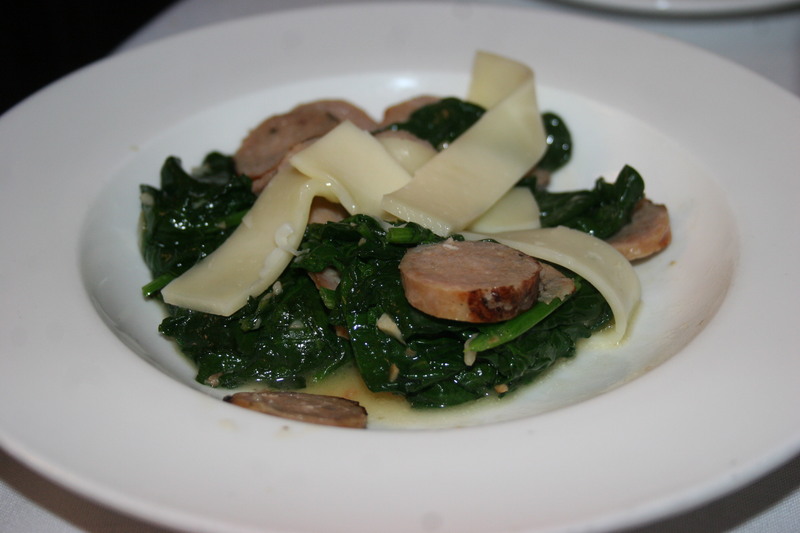 We all decided that Gerry had taken top honors with the appetizers with his selection of the roasted broccoli rabe with sausage and fontina cheese. This one would have made a nice entree. All of the ingredients forming the perfect marriage of meat, veggie and cheese. 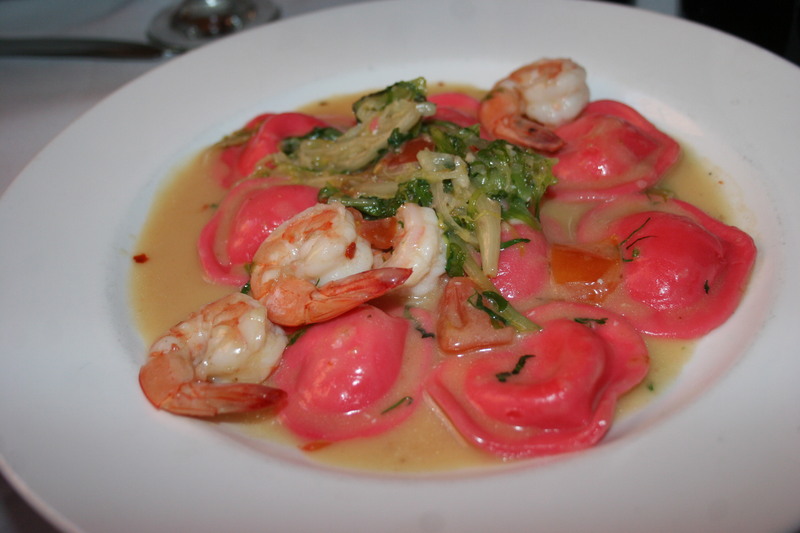 The ladies had no trouble making their choice as both of them chose the heart-shaped pink ravioli filled with fresh lobster meat and topped with some nicely cooked shrimp in a lemon garlic butter sauce. Fortunately my wife shared a small portion with me and that helped to explain the satisfied sounds they were making with each bite of this colorful and flavorful dish. Gerry found the perfect piece of meat to really bring out the flavors of the wine when he decided on the Stuffed Pork Chop. 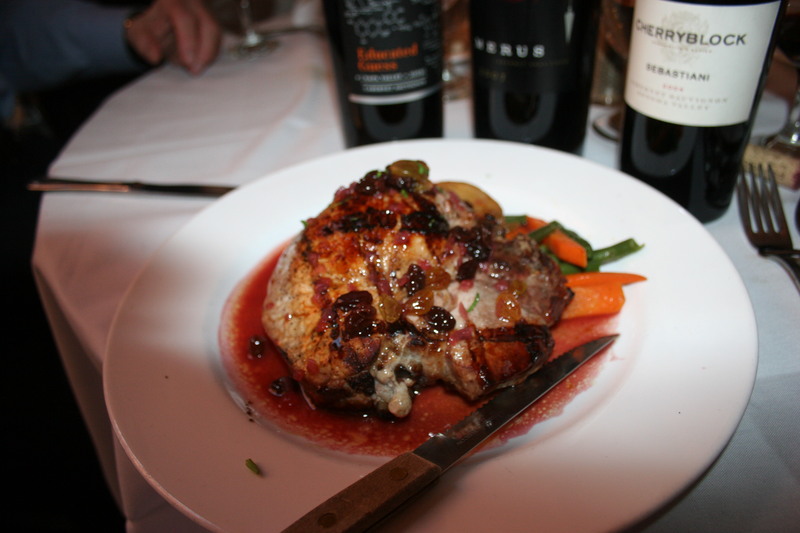 A huge piece of the “other white meat” filled with prosciutta and cheese served with carrots and green beans and covered in a wonderful raisin and zinfandel sauce. I also got a small sample of this one and it was delicious as well. I certainly had no complaints about my entree. 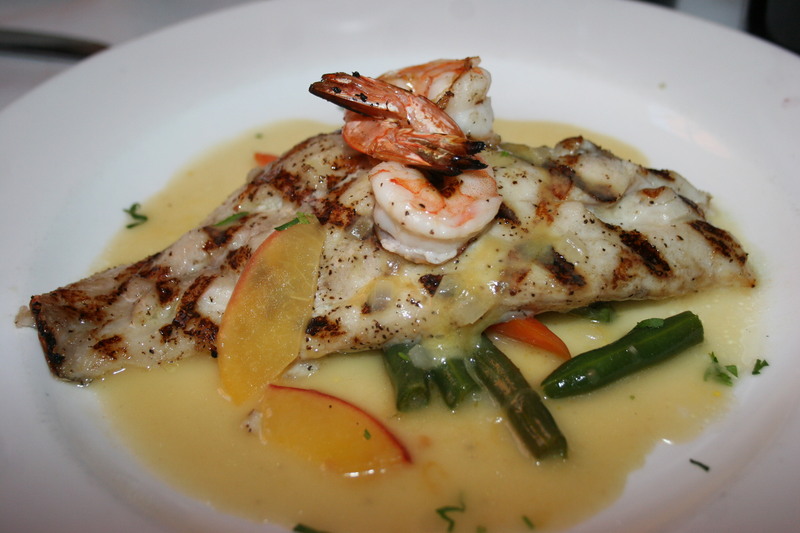 It was a wonderful piece of red snapper in a white wine and peach sauce served with shrimp and resting comfortably on the bed of carrots and green beans. The flavors were excellent with the thinly sliced peaches proving to go perfectly with the tender white fish. Throughout the meal, the service was attentive without being overbearing and the restaurant seemed to fill very well for an early Sunday evening. 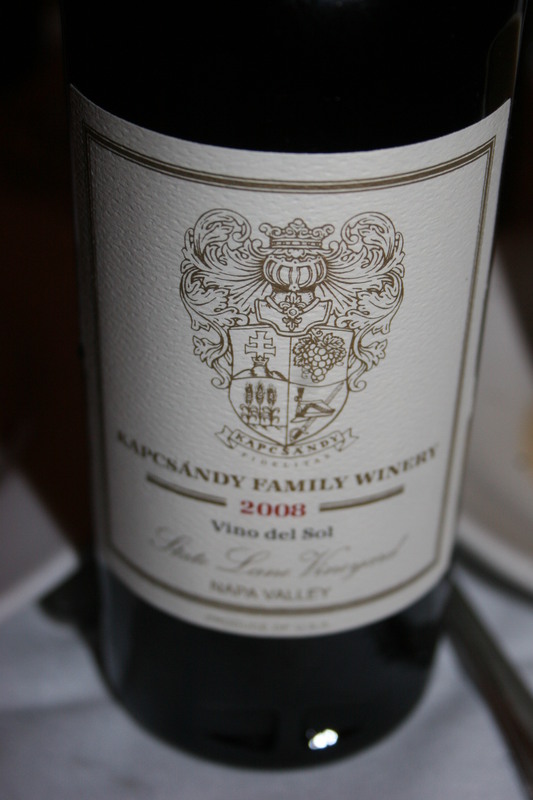 Although the portions were enough that all of us were contentedly happy to pass on dessert, we had to reconsider when Gerry revealed that he had also brought with him a bottle of the 2008 Kapcsandy, Vino del Sol, State Lane Vineyard, Dessert Wine. This one was purchased during our visit with Lou Kapcsandy last year in Napa. This is a Port-style dessert wine made from merlot, cabernet, cab franc and petite verdot and has the aroma of baked figs, plums, warm bread and sweet spices. In the mouth it explodes with peaches, cherries, plums and apricots with a dash of honey. It went perfectly with our desserts. 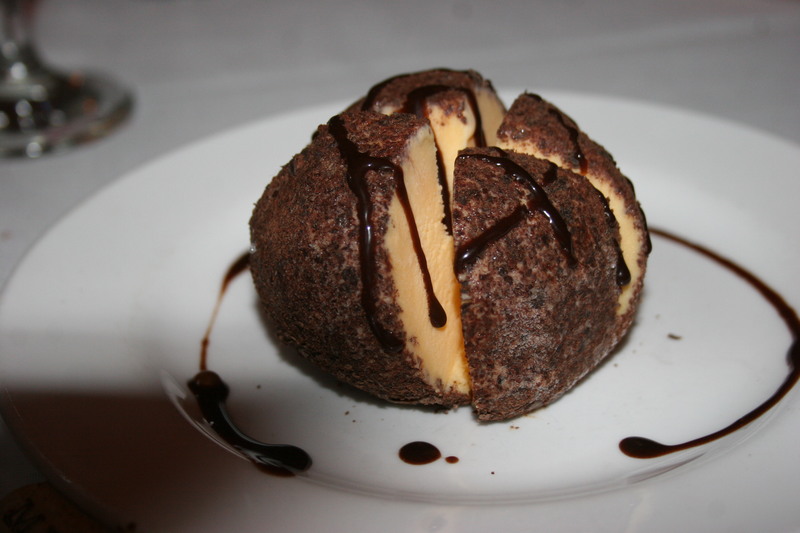 Once again the girls chose the same item, Tartufo, sweet Italian ice cream housed in a chocolate ball and coated with nuts. 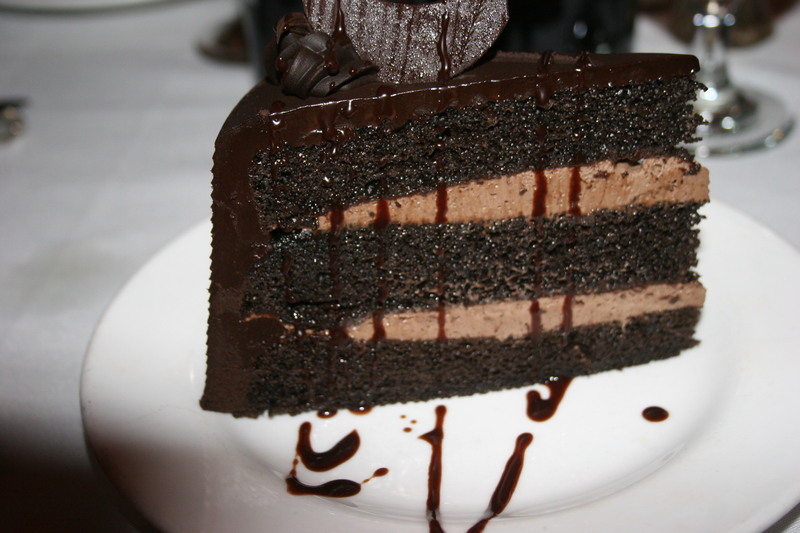 Gerry and I shared a Dark Side of the Moon, which was not a Pink Floyd CD, but rather a sumptuous piece of chocolate cake with alternating layers of dark chocolate and creamy chocolate mousse. Both dishes were perfectly complimented by the great dessert wine we shared. 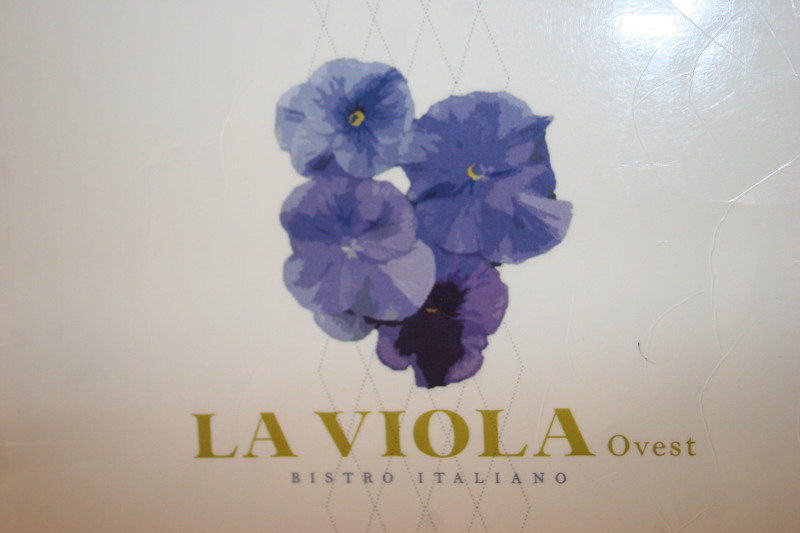 La Viola had passed the test and Gerry and Joann have found the spot for their son’s Rehearsal Dinner in december. It’s quite possible that a return visit to La Viola may well be in the cards prior to the end of the year. It was that good!